This tower covered in patterns of glazed tiles would have been the tallest in the world. The death of the Khan who ordered it put a stop to the project but what was built is still an impressive monument. It is easy to forget that Islamic scholars developed science and mathematics from the work of the Greeks while Europe struggled through the Dark Ages. The names of key mathematical ideas that come from the Arabic should remind us. 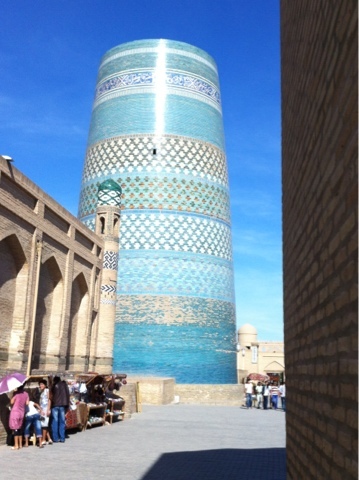 Khiva was the birthplace of Al Kwarizmi who gives his name to the idea he invented - algorithms.